How Are Your Seeds Cared For Before You Get Them? Do you know where your packet of seeds has been? Do you know how they have been treated before you buy them? Are you sure they were treated well so that they will be as viable as they possibly can be when you plant them? If you can’t answer these questions then perhaps it’s not your fault that your seeds did not germinate. It could well be that your seeds were dead when you got them. I am sure that at one time or another you have bought a packet of seeds, planted them, waited and nothing has happened. For many, they consider that they did something wrong, sometimes you do. Some seeds are finicky about their growing conditions. If they need light to germinate and you covered them, then they wont grow. Its always important to follow the growing instructions for seeds to have success. Some seeds are also very particular about temperature, light, moisture and other factors, but a great many for the most part will grow if you stick them in the ground and water them correctly. That is if you have viable seed to begin with. If your seeds were not treated well before you buy them then they most likely wont grow. Most seeds are fairly tough. They have a protective coating that helps to keep them moist inside and guard them from the rigors of the world. Most have to endure winters outside and hope they have fallen a an area that is favorable for them to grow the following year. However tough does not mean invulnerable. Treating seeds with care and storing them in the best way to keep them viable for the greatest length of time will help ensure that they will grow into healthy plants. Indeed that they will grow at all. First lets look at the life of a seed in the wild. It grows on the mother plant, it ripens and then gets dispersed in some manner. It then falls to the ground and waits. In most cases this means waiting though the cold winter months for spring and moisture to arrive so it can hopefully sprout. The seed lays dormant while it is cold. Therefore storing seeds in a cool to cold environment will keep them in that dormant stage for long periods of time. Indeed this is how all seeds are stored in seed banks the Svalbard Global Seed Vault is located high above the arctic circle. Scientists have long known that keeping seeds cold, dark and low humidity will keep them viable for long periods of time. So obviously keeping them under other conditions is not going to be good for their viability. So where has your seed packet been? Now let us consider that packet of seeds you might buy in the store. This could be a big box store, hardware store or garden center. First where is it when you see it? 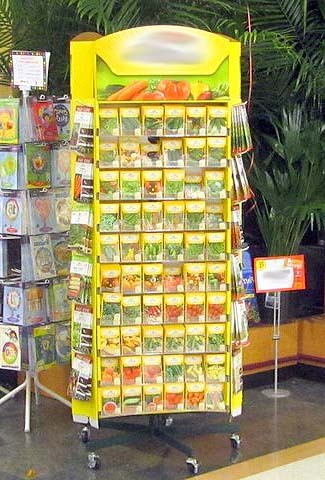 On a rack with lots of other seed packets in a nice warm heated store. It’s stuck up in the air with lots of warm air circulating around it. Is this a good environment for seeds? NO. 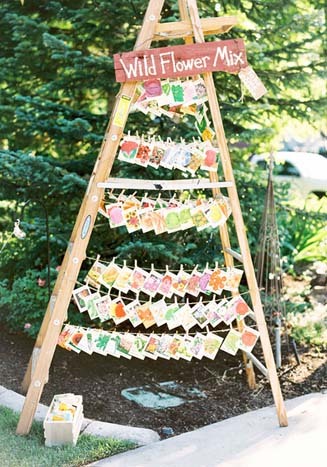 Seed rack in store. In bright light, next to card racks and backed by plants. Humidity will be high near the plants and bright light and heat is not ideal for seed viability. How long has it been on that rack? If you are fast you might be able to get to the seeds when they first arrive on the rack. Then they won’t have been out in the warm store for that long. 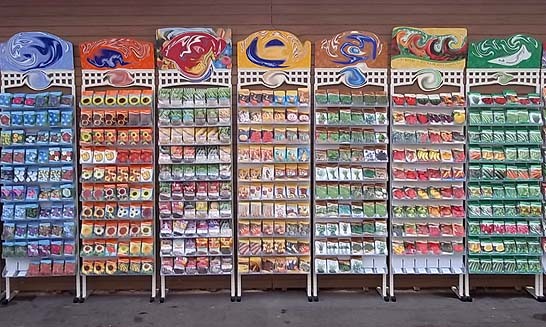 However most people come to get their seeds long after they have been sitting on that rack. How long have they been there, weeks months? All that time in a warm store. Where is the rack located? Good stores will put them far inside the store where the temperatures are fairly even, but I have seen many stores put them in windows where the sun beats down on them during the day heating up the seeds, or in the greenhouse section of the garden center. Is that seed going to be viable when you do plant it? Unless it’s very tough, probably not. How did your seed packet get to the rack in the first place? Most likely it came in a truck. Packed in a box. That might be fine but it depends on where that truck has been. Has it been moving through sunny hot climates before it got to your store? It’s possible that box could have been left on the loading dock in the sun for hours, maybe longer getting hotter and hotter. Seeds don’t like that. This rack is outdoors in bright sunshine! This is just death to seeds! How far has it travelled to get to your local store. Or even your online store? Don’t assume that the seeds you buy are grown here. Most are not. Most seed companies won’t tell you where their seeds come from and their websites often talk about their garden centers or such like but their seeds are not grown here. A large proportion of seeds come from Holland, Germany, Poland and China. Yes, I was surprised too. Often the seeds are travelling very long distances across oceans before they reach the wholesaler, who may then repackage them into those colorful packets that you buy in the stores. In some instances it’s not even clear what year the seeds were grown in before they reach you. How was the seed processed and stored to begin with? A large proportion of seed companies don’t store their seeds in cold conditions. Having been to many different seed conferences and talked to other seed growers I am always shocked to find how they store their seeds. Many small companies just keep them in boxes in their house, others have a commerical building but because they are using it all the time it’s heated. A lot of times these are metal buildings and they get darn hot in the summer months. This might be fine if you can sell your seed on very fast to your buyers but it’s never a good place to keep seed for even a few days. Surprisingly most seed packets don’t have any kind of date on them. They don’t even tell you what year the seed you bought was grown in. This means that you could be buying packets that are years old. Just where has that seed packet been stored and for how long? One of the reasons that some seed companies do this is because the seed may be several years old if it has traveled the world before it got to your seed packet. Another is so they can sell on last years stock and not take a loss on seeds that were not so popular. That might be OK to do IF the seeds were stored in the right conditions in the meantime, but most of the time they are not, just stuck in some warehouse somewhere that is usually not climate controlled to keep it cool in the summer. We grow all our own seeds. Yes, we do buy seed to grow, it’s the only way we can get new and different plants to grow. Mostly these won’t be organic when we get them so we need to grow them on at least two years before they are producing organic seeds for us. We have to buy seed from overseas because mostly they are not produced here. Even those times I bought from a ‘local’ dealer I found that the seeds were actually coming from overseas and being sold on by those companies. Surprisingly a large number of seed companies do this. Once our plants are established we then collect our seed from the field and store it in a cool seed storage barn. Ours is located under dense tree cover so it stays as cool as possible throughout the year. Once the seeds material arrives it may be laid out on racks to fully dry or if already dry stored in bins until we have the time to process it. We then do as much bulk processing as possible. This removes as much large material as we can, then we store the remaining material in a cooler atmosphere. As soon as we have time the seed will then be sifted to remove as much material as possible from the seed. As we state in are FAQ it takes an enormous amount of effort to remove all the material from the seeds unless many thousands of dollars are spent on seed cleaning machines which we cant yet afford on our little farm. We remove all the material we can then our seed is stored in bulk in refrigeration units that are designed to keep a constant humidity and temperature. All our seeds remain there until they are sold directly to you. We package our seeds for each order. This ensures that all the seeds you buy have been stored at the best possible temperature for the longest possible time thus keeping the seeds in the best possible condition before they are sent to you. We also date our seeds with the year that they were harvested so you know how old the seed you are getting is. In almost all cases we use seed grown in year before so 2016 seed would be used in 2017. Occasionally we use older seed if we did not grow that seed in a particular year or if the harvest failed, which does happen on occasion but its very rare with such a diverse farm. Dating seed ensures that you know exactly how fresh the seed you are getting is and when it was grown. When shipping our seeds we take all our orders directly to the post office and post them inside the building. This ensures that they stay as cool as possible for as long as we can manage. We don’t place them in hot mail boxes or give them to open air mail carriers. This is especially important during hotter summer months. In this way the seeds we offer are as fresh and viable as they can possibly be. So our seeds are shipped directly to you from our cooled storage giving them the least possible time in less than idea conditions. So if you buy our seeds you know exactly where they have been and how they were treated until they were sent to you. We always recommend that you place your seeds in the refrigerator as soon as they arrive and that you keep them their until planting. If you don’t use the whole packet then put the rest back. Use them again next year, they should be fine. Author Janice Hazeldine PhDPosted on February 27, 2017 February 24, 2017 Categories garden concepts, Garden work, plants, things to doTags care of plant seeds, choosing seeds, do you know where you seed has been, how to choose seeds for your garden, how were your seeds cared for, plant seeds, what to know about your seedsLeave a comment on How Are Your Seeds Cared For Before You Get Them? Winter is the best time to plan your summer garden. What you need to know before deciding on which seeds to buy. Its cold and maybe snowy outside. There is not much chance of getting anything done in the garden. But this is the BEST BIT. Now you get to decide what you are going to grow this coming year. There are several ways of going about this. 1. Decide exactly what you want to grow, then go and find the seeds (or plants) for it. 2. Have a general idea then browse the catalogs to find things that fit your theme or idea. 3. Have no idea so browse catalogs and online to find thing that take your fancy. 4. Combinations of the above. I have to admit that 1 and 2 are what I do but occasionally something else comes up in my wanderings across the internet and I add it to my list of things to grow. Whatever your choice winter is the best time to do this. You can curl up with a catalog, or browse online in your favorite way. Check out all the great plants that you could grow and make your choices. It’s a great way to spend the winter afternoons. Or all day if you feel like it. There are a few guidelines that you should work with however when choosing your seeds and plants. 1. Where are you going to put them? This tends to be the biggest problem for a keen gardener who wants all kinds of plants but then finds there is not enough room to fit them all in the garden. Heck I have an 8 acre farm and I still have this problem. I think I would still have the problem if I had 40 acres. You tend to expand to fit the space you have. Plants also tend to take up more space than you expect them too so plan for less and then they can grow into it. Mixed garden border. Taller plants in the center and shorter on the outside. 2. What is your climate? This is really one of the most important factors. You cant grow tropical plants outside in Northern latitudes and you cant grow cold loving plants in warm southern latitudes. There are always exceptions. If you have a heated greenhouse then of course you can grow tropical plants in cold areas, you may also be able to grow them as annuals if your summers get hot enough. However if your summers are cool then picking something that likes a lot of heat is never going to work for you. Picking a plant that likes cool climates wont work in Florida or a tropical country either. Always know what climate zone you are in. I will have an article on climate zones later this week so check that out if you are unsure what it means. There is a lot more to a zone map than just hardiness of plants. Make sure you check your heat AND cold zones. This is very important when choosing plants. If for example you are zone 6 then trying to grow a plant that liked zone 8 is not going to work for you. Most seed catalogs will show the zone that the plant is hardy to. Annuals usually don’t have zone listings since its expected that the plant will die off during the winter anyway. However if an annual likes hot weather you still need to make sure that you have enough heat during the summer to grow it well. 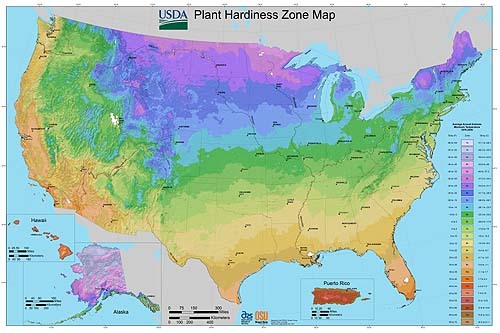 Plant Hardiness map of the United States. 3. Know your soil type. Quite a lot of plants will only grow on certain soil types. This is why when you travel to a different area you will find plants that you don’t see around your own home. Sometimes this may not be very far at all if the soil or rock type changes dramatically. There are many plants that will only grow on limestone and chalky soils. 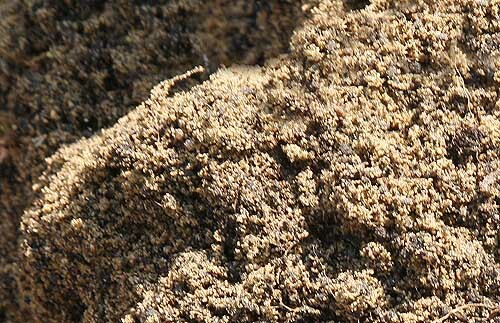 If you don’t have this type of soil then the plant will not survive unless you import soil specifically for it. The same is true of many other plants. Some like rich loamy soils, other like sandy soils some even like clay and waterlogged soils. If a plant you are trying to grow is not doing well, do a little research and check out the soil type it prefers. It may well be that you are trying to grow it on a soil that is not suitable. Many good seed catalogs will tell you what kind of soil the plant prefers. We always ensure that the plant seeds we sell state the preferred soil type. Trying to grow something on a different soil type might work but its not going to be as happy and healthy as the type it really prefers. So when choosing plants try to pick those that will work with your soil type. 4. What kind of sunlight do you have? If you have full sun most of them time then your options are pretty wide. If you have a lot of shade then your options are more limited. You can still create a wonderful garden with shade but its going to take a bit more work, at least to start with. Check what kind of light a plant needs before you choose it. If you don’t have a lot of sun picking sun loving plants is going to end in disaster. If you put a shade loving plant in the sun its also going to end up dead. So determine what areas you want to plant, and what the sunlight levels are before you start. All catalogs will tell you how much sun a plant needs. Don’t ignore this its there for a good reason. 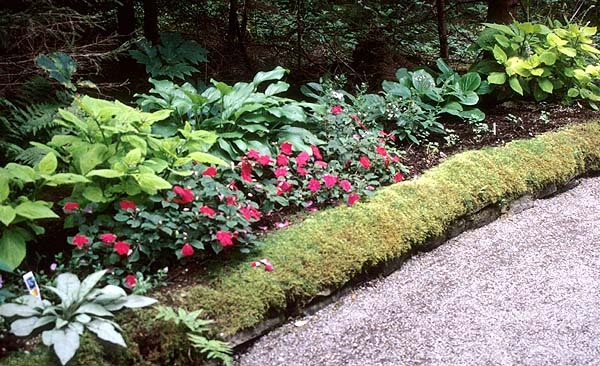 Shade loving plants growing under trees with lovely moss front border. 5. What kind of height do you want? Some plants can grow very tall, others are very short creeping groundcovers. Make sure you know what your chosen plant is going to do. It’s a nasty surprise if you put in a plant thinking its going to be short and find it grows to 6 feet in height! Plant descriptions usually tell you how tall they will grow. If it does not then check another source until you know for sure not knowing can cause a lot of trouble in the garden later on. 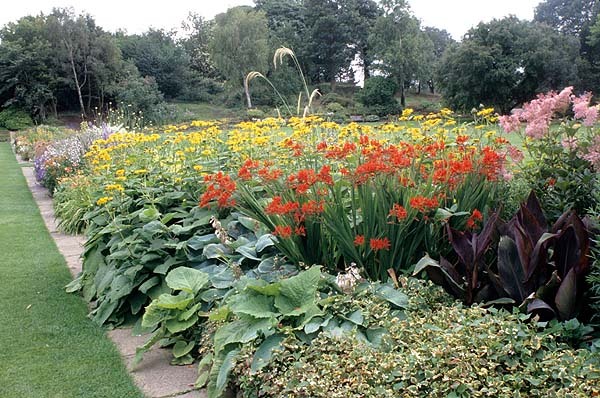 If creating a border then you will most likely want some that are fairly tall for the back, some middle height for the center and short ones for the front. Check out any professional garden border or photo and you will see this arrangement. 6. Decide what kind of plant you want. 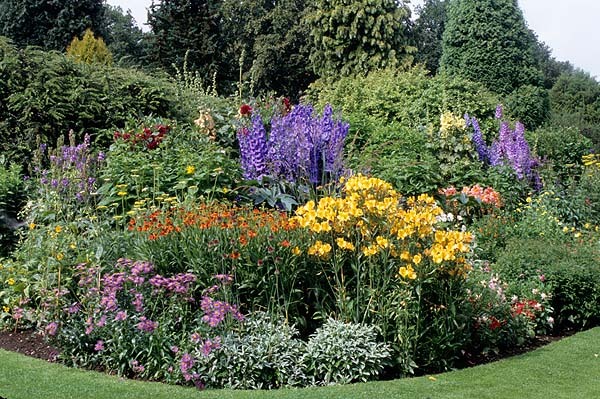 Perennials take longer to establish but then you don’t have to plant them every year, you just have to maintain them and divide them when they start to outgrow their area. However perennials tend to flower for short periods of time, the rest of the time you just get leaves. Annuals you have to plant every single year which is more work. 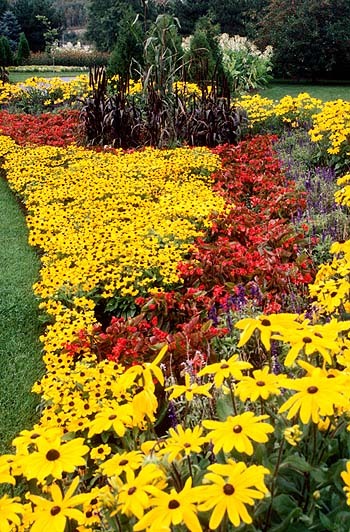 However annuals tend to flower profusely for much longer periods of time giving a lot more color and show. Most people go for a mixture of both for the best results. So now you have a good idea of how much space you have, what kind of soil, sunlight levels and climate zone you are in. Now its time to pick your plants. This can be the hardest part, there always seem to be so many interesting plants that you want to grow and not enough time or space to put them. Best option is to make a list of all the plants you have found that you like. How you organize this is up to you. Me I tend to open a browser tab for each plant, use post it notes in paper catalogs and make a paper list. The list is always long, much longer than I have space for. Then comes the hard part. Cutting down the list. Crossing off the ones that you cant have, Noting the ones that you cant live without this coming year. Cutting the list down until it’s a reasonable size and the cost is not overwhelming. A FEW THINGS TO CONSIDER WHEN CHOOSING. 1. If you are picking a plant for a particular reason say a herb that you need for health, then of course it should come top of the list. 2. Things that have really taken your fancy or you have seen and loved should be next. 3. There is always next year. You may need to make a second list of ‘what I will buy next year’ if you don’t have room for everything this year. Of course this will change next year but it gives you a foundation to work on. 4. Cross off anything that you can live without this year. 5. Make sure that you choose MORE than you think you will be able to grow. The reason for this is that not everything ever goes as planned. Some seeds that you buy may not germinate, others may do poorly or you may have a disaster, perhaps one set accidently did not get watered and died. Having grown plants from seed professionally for over 25 years I find that this happens to me a lot more than I would like. Sometimes plants just don’t thrive or a rabbit gets in and eats a whole crop row down to nothing. Now suddenly you have a large hole in your garden having some extra plants of a different kind to quickly fill the hole up is a lot easier than either having a large gap or having to run to the garden center and find something, which of course will cost far more than if you raised it yourself. 6. Don’t be afraid to experiment. Seeds are inexpensive compared to plants. So go ahead and try something new. IF it does not work out move on to something else. Gardeners are forever experimenting, trying new things and learning. Growing more plants that you have room for is far better than not growing enough and staying safe with a few plants from the garden center. So go wild, order lots of seeds and dig in. It’s a inexpensive way to enjoy life and its healthy for you. Author Janice Hazeldine PhDPosted on January 29, 2017 January 29, 2017 Categories garden concepts, plants, things to doTags choosing seeds, choosing what to plant, how to choose seeds for your garden, how to plan your summer garden, making plant choicesLeave a comment on Winter is the best time to plan your summer garden.